Since the 2008 Olympics there has been a big buzz around a certain colored athletic tape. That tape is called Kinesio Tape. The tape is designed to mimic the skins surface tension and aid in rehab. It has many functions from reinforcing an injured muscle to joint to edema reduction and every where in between. It comes in a variety of colors, sizes, and shapes. 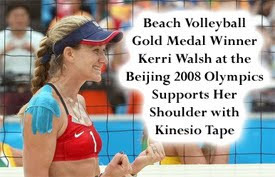 Kinesio Tape can be found at your local rehab center such as Performance Edge Chiropractic. It works best when applied by a certified practitioner such as Dr. Baio. While the original buzz was started with women’s beach volley ball, it has since extended in to most sports and most recently has made its way to Wimbledon.